This weekend I decided to take part in the RSPB Big Garden Bird watch. I have to say, purposeful bird watching is not something I’ve done before or really wanted to do before – don’t get me wrong, if I’m out and about and I happen to see some rare or unusual bird life I’m as delighted as the next person, but sitting still (and being quiet) for long periods of time has never been one of my talents! However having watched something about the event on the telly last week I thought it would do no harm to lend a hand! The BBC programme had explained that this year’s ‘watch’ had even greater importance than normal because of the need to consider the impact of the extremely snowy and cold weather this winter on the garden bird population. Knowing the impact it had on me, I thought it might be interesting to see how our feathered friends had been affected without advantages such as an open fire and plenty of jumpers. So, having downloaded the bird counting sheet from the website, I began my hour of bird watching poised in anticipation, pen ready in hand, at my sitting room window looking out at the bird table in my small front garden. 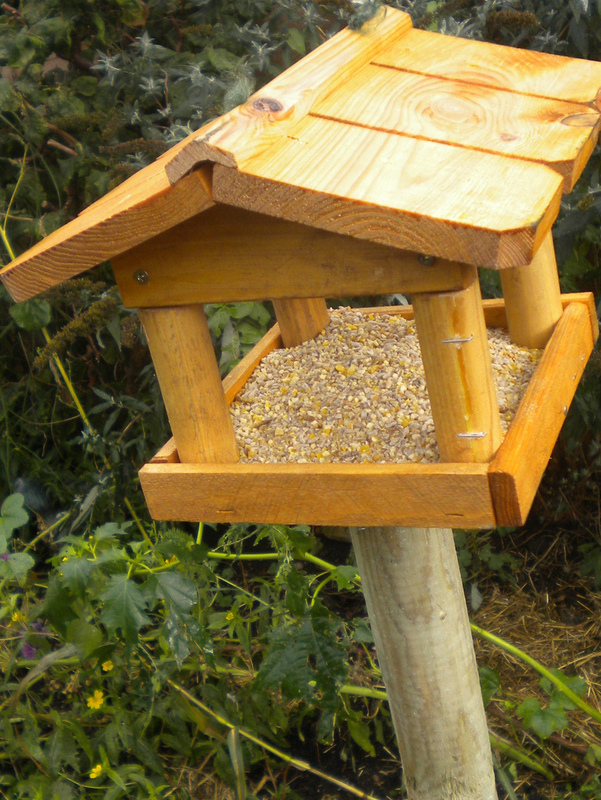 But as the minutes ticked by, expectation gradually turned to disappointment and my initial eagerness slowly became despondency at the lack of winged characters willing to take advantage of the array of nuts my well stocked bird feeder had on offer! You’d not see me turn down free food! 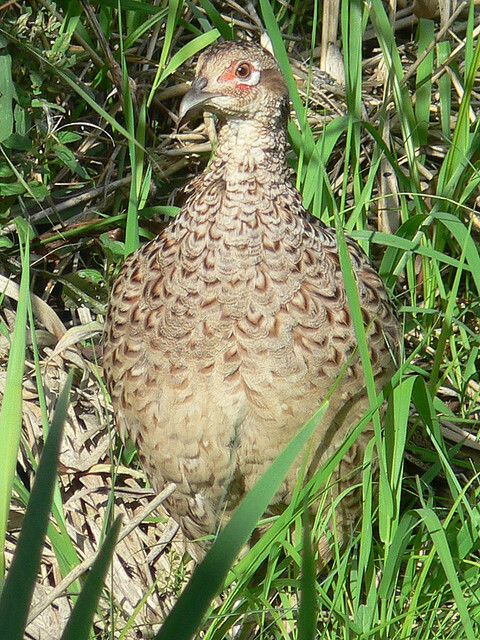 In fact, in the whole hour I only saw 3 rather dishevelled female Pheasants sneaking along, carefully sticking close to the side of a dyke on the hill beyond my garden (probably wisely avoiding the danger of the open hillside on a shoot day). And yeah, you guessed it- Pheasants weren’t even included on my bird watching sheet!! Feeling rather defeated at the end of my vigilant watch, my thoughts turned to why I hadn’t seen any of the garden birds I had hoped to? Perhaps they knew what I was up to and were sat, just out of my range of sight, having a wee chuckle together about how frustrated I would be if they avoided my garden for this particular hour! Or more worryingly, could the harsh winter weather, and the resulting lack of available food, be the cause for their unfortunate absence? Or maybe my nearest neighbour, half a mile down the valley, had a better selection of bird goodies on offer and I was simply being snubbed! The following morning, after a hearty breakfast, I think I got my answer. As I stood at the kitchen window doing the washing up, a shadow fell over the back garden and a greyish blue-brown coloured feathered creature, with yellow legs and piercing eyes, promptly swooped down and elegantly landed on the fence. This rather magnificent bird is not a stranger to the area around my cottage; I have often seen this mighty bird of prey expertly riding the up-drafts when I’m out walking nearby – but never in the garden before! And then it dawned on me, this fine animal was probably the reason my well planned observation had been so unsuccessful and the key is in its name – Sparrowhawk! 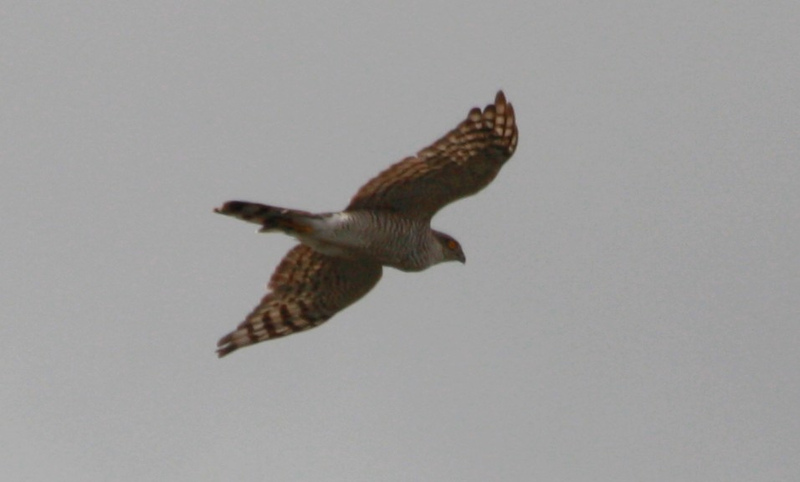 Known to prey on smaller birds, as well as small mammals and insects, adult Sparrowhawks are thought to, on average, consume about 2 small birds a day. I know I should have felt privileged to have this beautiful bird grace me with its presence so close to my home, especially considering its secretive nature; but the timing of its visit, just after my first attempt at bird watching, did seem a little ironic! And as it sat proudly on the fence, no doubt pausing mid hunt, I could have sworn it was grinning at me!